Some search terms are more competitive than others. This is an important thing to remember because if you decide that you want to be #1 for “blogging” you have a lot of work cut out for you. However, if you wish to rank for “yellow iguana carrots” then the journey will be a bit quicker. SEO revolves completely around keywords. If you want to do well in the search engines you can’t blindly write posts and hope that you appear for some things. You are better off targeting specific keywords to give yourself a better shot of doing well. So how does SEO even work? To get to the bottom of it, you need to understand how Google works and what it is looking for. First and foremost it is important to remember that Google needs to provide a great user experience. People trust Google to help them find what they are looking for and Google can’t do that then people will eventually leave to other services that can. Therefore it is Google’s job to try and get the most relevant links to the top of the search results. This doesn’t happen all of the time, but more times than not, Google does an excellent job of ensuring that the best is the best. But the best to Google might not be the best to you so it’s important to understand what makes Google think something is the best. Let’s start with the content first. If the content is crap then people won’t read it. You know this already for your blog. The better your content, the better chance you have of succeeding with an audience. Google loves great content as well. 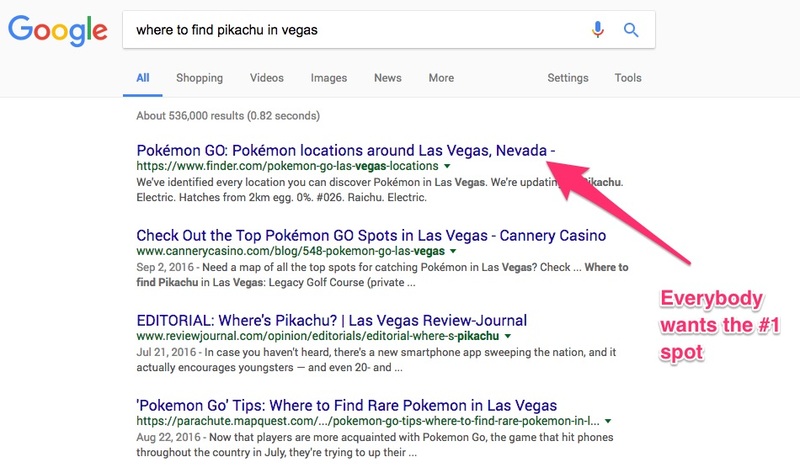 When a user searches for something on Google and Google recommends a certain site, then how awesome does Google look to the user when the site was exactly what the user was looking for? Of course, me telling you to write quality content isn’t that great of advice because what constitutes great content? That is something that your audience will come to decide, but if your content does its job and helps the reader solve a particular problem, then you are going down the right path. If you’re curious about what else goes into great content then check out how to write a powerful post. How Many Words Does Great Content Have? Great content shouldn’t be based on the number of words it contains. If you write a 5,000-word opus on how to build your Twitter profile and I write about the same thing but do it in 2,000 words is your post better than mine solely because it has more words? It’s probably better because those 5,000 words go much more in-depth into the topic and therefore provide more value to the reader. One of the arguments against long content that I hear frequently is how nobody reads it. This is true for the people that aren’t really looking for a solution, but those people that really want to solve a problem will have no problem reading every single word. If you’re looking to write content that every single person devours then you might want to stick with cat photo galleries. One of the reasons why you hear a lot of SEO gurus say that long articles are better is because studies have shown that they are. On average, the #1 link in a search result has over 2400 words! More words give you more chances to provide value along with more opportunities to get your keywords into the content. Don’t be scared to go very deep into a topic. By default, if a post that I’m writing has less than 2,000 words I try to figure out what I’m missing from it. Sometimes I’m not missing anything and I really feel that I’ve added everything that I could but more times than not there is always more useful information that I can get in there. Therefore the general rule is that the great content is associated with a good amount of words. If the content is good then people will link to it if they know about it. When Google first started they used a fancy algorithm called Pagerank. It was a number from 0 to 10 that depicted the strength of a page. The strength was determined by the number of links to that page. Ever since then website owners have been trying every tactic imaginable to get links back to their sites. However, don’t think that any old link will do. The quality of the site linking to you plays a huge role on the impact of the backlink. You can’t just create 100 little sites that are crappy and link them to your site. Or sign up for a dozen different forums and spam them with your blog. While you can’t always control the quality of a backlink, if you are going to actively pursue backlinks you will want to do so from sites that have some authority. The higher the numbers the better. If you actively hunt for backlinks and are getting them from sites with a domain authority of 5 and a page authority of 4 you shouldn’t expect much of an impact on your search engine rankings. All backlinks are not created equal. So there you have the basic formula for doing well in Google. The rest of this guide is meant to show you how to do the smaller things in WordPress that can greatly increase your chances of ranking higher in search engines. This section and the following section pertain mostly to WordPress specific things. Although a lot of it is manipulating HTML so it can apply to any type of site, these sections show you how to do these changes in WordPess. Before we dive into the details I want to explain the plugin that I use to help me with SEO on my blogs. There are a number of good SEO plugins for WordPress but the one I like to use is Yoast SEO. I’m not a salesperson for them or affiliated with them in any way. It’s just that I’ve stuck with it the longest and so it is the one I recommend to other WordPress users. It is important to keep in mind that just by using an SEO plugin for WordPress you won’t drastically improve your SEO. For that to happen you need to implement good practices that your SEO plugin should make easier. Doing any type of SEO is pointless if you don’t have a keyphrase. Your keyword is where you will put all your SEO focus. What is a keyword? It’s simply a term that you want to rank well within Google. 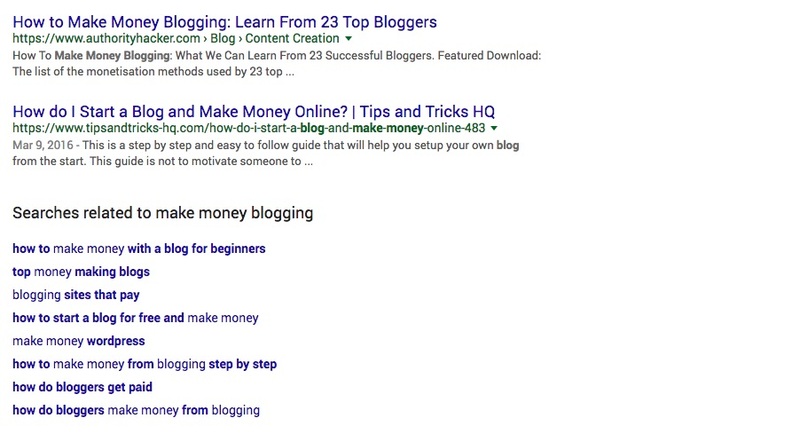 For Obstacle.co, a good keyphrase to rank for would be “make money blogging”. Every post you write might have a different keyphrase that you try to rank for but overall you want to try and keep your blog centered around a keyphrase theme. It doesn’t make sense to spend most of my time trying to rank for the keyphrase “make money blogging” and then on some random blog post I decide that I want to rank well for “feeding giraffes”. More and more pro-SEO people are advising that you target a cluster of keywords in a single post. This gives you the opportunity to rank well for a number of different keywords. This ties into writing longer posts that are higher quality. You might already have some keyphrases in mind but you’d be surprised by the search volume they receive. It’s possible to find how well a keyphrase does in Google by using the Keyword Planner Tool. Another tool that you can use is UberSuggest. This tool functions similarly to Google’s Suggestions features and helps you to find more related keywords. Once you’ve locked down a keyword you can focus on getting it implemented in the following ways outlined below. What’s the first thing that you see in Google for a search result? The title of the page! If you can’t get the title of a post right then you’ve already sunk your ship. The title tag is probably the most important aspect of SEO because it lets Google know what your page is about. If Google can’t figure it out then how will your readers? When I refer to the title of the page I mean what you see in Google search results or the tab in your browser. Not the first big headline of a page. Some WordPress installations will have the page title as Blog Name – Post Title and many people keep it like that because they like to have their blog name first for vanity reasons. You don’t want to do this because your blog’s homepage will already rank well for the blog name so it doesn’t need to appear anymore. A good practice is to simply remove the blog name altogether so that only the post title shows. Some bloggers have said that they’ve received a massive boost in rankings from removing their blog’s name from post titles. It makes sense because when someone performs a search query they don’t care about the site’s title. They care about the information on the page that is supposed to help them. Follow the same steps for the Pages section and then save. Look at these search results and you’ll notice that each of them has a little summary under the page title. Google tries to get that summary from the meta tag description. 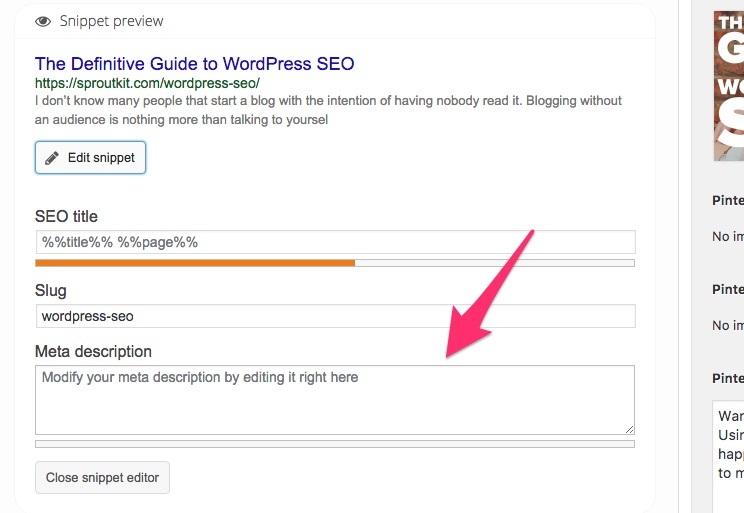 If your page doesn’t have the meta tag description then it will grab the first couple lines from your blog post. For this reason, you always want to make sure you provide an SEO-friendly meta description for each of your blog posts. Yoast SEO makes this extremely easy. What constitutes a good meta tag description? Think about the person performing a search in Google. Will the meta description reinforce the page title and convince them that your link is the link they want to click on? Permalinks are simply the URLs of your post. This portion, /make-money-blogging, is considered the permalink. By default, WordPress doesn’t like to use this simple permalink style. You have to tell WordPress to do so and it’s pretty simple. What do you do if you’ve already setup WordPress and have been publishing posts using a different permalink structure? 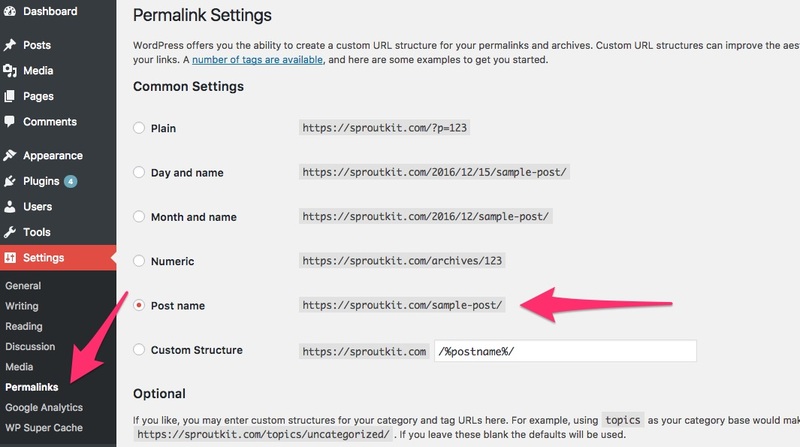 Switch to the cleaner permalink structure and make sure that your old permalinks are redirecting correctly to the new ones. If you’re just starting off with a blog and WordPress then you definitely want to go with the clean permalink structure right from the beginning. Your blog by default has two web address. To you, they may be the same thing because you get the exact same result when you type them in. However, to search engines, this appears to be two different sites and they are treated as such. That means you should pick how you want your site to be represented. I always go for the non-WWW version because I like to be as succinct as possible. To ensure that your site uses only one version go to Settings > General and set the desired address. There are certain words that Google completely ignores in search queries because they don’t enhance the search. These include words like “a”, “and”, “the”, “to” and others. Because Google ignores these stop words it doesn’t make sense to have them in your permalinks. SSL is a secure authentication method for websites. Websites that use this have https:// in front of their URLs. In 2014, Google noted that it would give minor ranking benefit to sites that implemented SSL. For the longest time to get SSL you had to buy a secure certificate but now there are services that offer it for free. Check with your web host to see what your options are and try to get your blog on a secure domain. All good blog posts have images. Besides being a great thing for the user experience, images also give you a chance to sneak in your keyphrase some more. If you don’t know what the alt attribute is, it’s a property of the HTML image tag. Its original purpose was to provide an alternative for people that use screen readers and can’t see images. The alt attribute is meant to be the descriptive version of the image. In WordPress, when inserting images through your media library you are given the option to add an alt attribute. By default, WordPress will automatically add text to the alt attribute but it will add the filename so it isn’t very helpful unless the filename is your keyword. Pingbacks are pretty cool. Remember when we talked about the importance of backlinks? Most bloggers don’t actively track who is linking to them so it can be hard to reciprocate love to the people that show you love. When you have pingbacks enabled and another WordPress blog that links to you has them enabled as well, when they link to you will be notified of the link. This can be helpful because if you are linking out to other sites (as you should) then you hope they can see that you are linking to them. Show them enough love and maybe they’ll link back to you. Of course, there are more proactive ways to get backlinks to your site but this is a good passive way to try and increase your SEO. Interlinking is the practice of linking to other pages on your site. You already do this in your navigation but you want to make sure you actively do this in your blog posts. If possible try to get at least one relevant and contextual link in your blog post into another blog post on your site. If all of your posts fall under the same topic this shouldn’t be much of a problem. It’s also important to go back to your old posts from time to time and add links to the newer posts. Just because you are done writing a post doesn’t mean you are actually done writing a post. I suggest that you do a monthly audit of your old posts to find new opportunities to link to the more recent posts. Most themes are doing a better job of SEO optimization right out of the box. However, you want to make sure you are getting the best SEO optimization possible so here are some things to look out for in your theme. You want to ensure that your post title is within a <h1> tag. This is the top tier heading in HTML and each page should only have one <h1> so it makes sense that the post title be the one to occupy it. Google loves fast sites so you want to make sure that the code is optimized in your theme so that it loads quickly. For non-developers, there isn’t much you can do within the theme itself but everyone should look into installing a caching plugin. I recommend WP Super Cache. Back in the days, it was cool to link all of your buddies in your sidebar but search engines are starting to discount sitewide links more and more. Having a ton of links to external sites in your sidebar also gives your visitors more opportunities to leave your site so try your best to keep things under control. If the user experience is your most important thing then consider a theme that doesn’t have a sidebar. I would suggest you completely understand the basics before you jump on over to the advanced stuff. Or maybe you’re just the type that likes to read ahead and come back again and again. In this section, I want to cover more of the advanced topics with regards to WordPress SEO. These are things that don’t seem like that big of a deal but you want to be able to squeeze as much SEO juice out of this lemon as possible. Depending on your blog’s theme you can have a lot of different pages that you might not even be paying attention to. 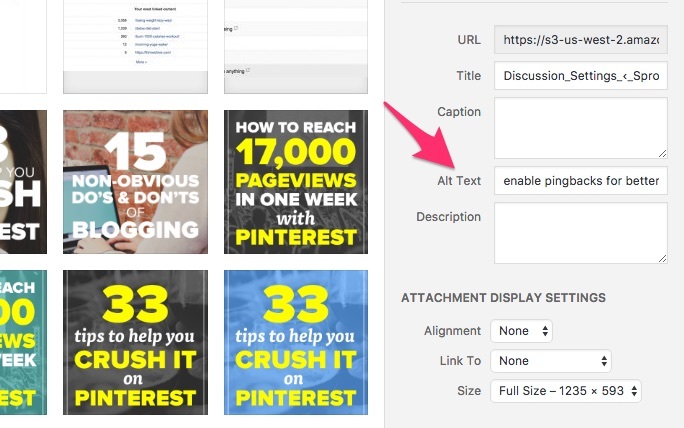 Archive, Category, Pagination, and Tag pages are simply pages that list your blog posts. They are great for the users but terrible for search engine bots. The reason why is that these pages don’t serve any value beyond sending people to the blog posts they are looking for. Because of that, you don’t want them to appear in any of your search engine results. To accomplish this you need to apply the noindex meta tag to them. 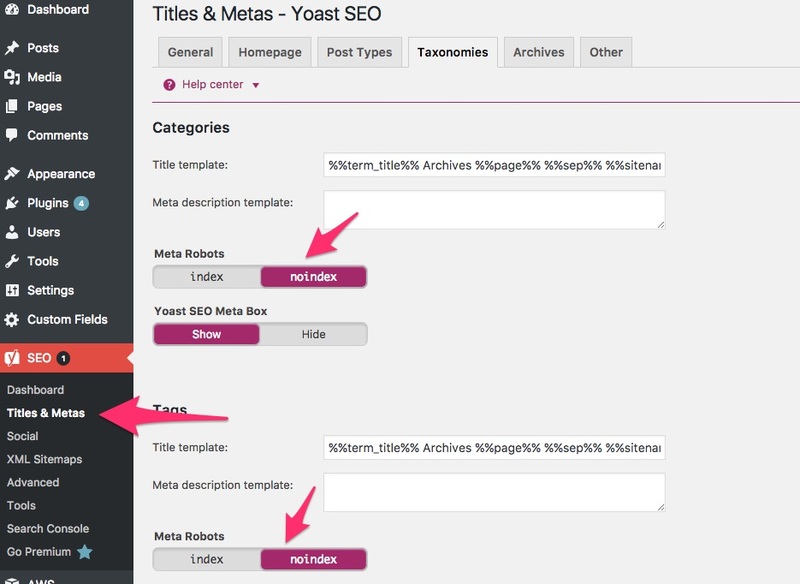 As usual, Yoast SEO makes this pretty easy to do. Again this is determined by your blog’s theme, but it doesn’t mean much unless you are getting 100s of comments for each blog post. Some themes add pagination to comments so that after some point, a user has to click a link to see the next set of comments. This is actually a whole new page that can be indexed by Google. You’ve probably guessed by now that these pages have no value to people using Google so it makes sense to turn them off. Google is pretty good at knowing when you update your site but if you want to be positive that it knows then you can use an XML Sitemap. A Sitemap is a document that lays out the structure for your entire blog showing how posts and pages are connected. 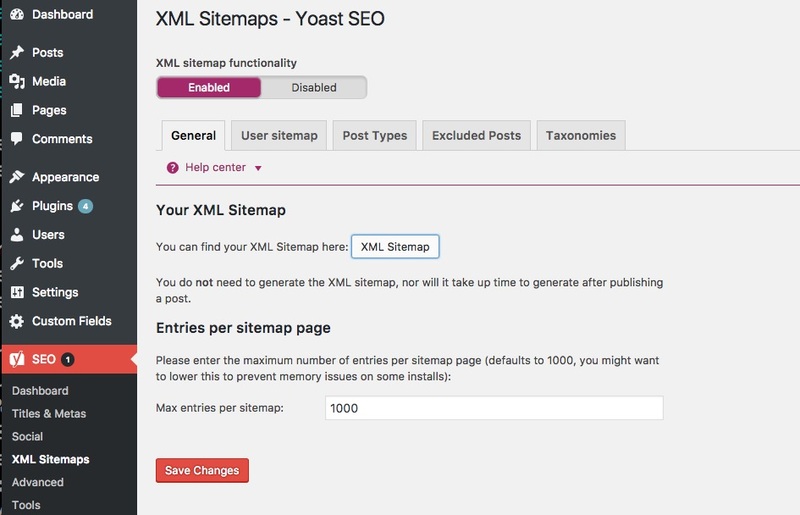 Yoast SEO makes the generation of a sitemap really easy. This really isn’t an option if you want to do well with Google. It’s in Google’s best interest for you to learn how to rank better with them because then that means you are producing better content and helping Google present a better product. Google Webmaster Tools is a free set of tools that gives you insight into how Google views your site. By implementing the guidelines in this guide you’ll find yourself in a better position than a lot of the blog in your niche. Everything that you worked on so far involves on-site optimizations. There is one big piece missing from all of this and that is building links from other sites. We talked about this briefly in the section on enabling pingbacks, but if you really want to get serious about building up your SEO then you need to take the necessary steps to building links. For some blogs, this can be as simple as writing great content. When you are an established authority site other sites link to you. When you are just starting off as a blogger you will have to reach out to other bloggers for backlinks. In no way should you blatantly ask for a link but show them the content that you feel is relevant to their audience. Great bloggers are great curators that don’t want to link to every single person they come across. Just like Google, a blogger’s audience trust that they will send them to quality content and if they don’t then they can quickly lose their trust. 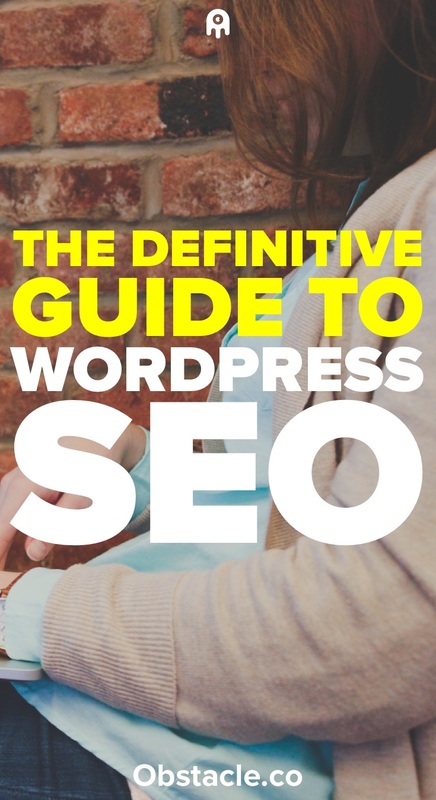 You don’t get what you don’t ask for so I’m asking you to take a second to share WordPress SEO: The Definitive Guide for Bloggers with your audience. They respect great content.